QAMISHLO, Syria: When Rad Mecid Sexmus, 40, became the latest Kurdish shahid (martyr), killed securing a checkpoint in this northern town, it was a clear sign that the civil war is advancing into the Kurdish dominated areas in the north of Syria. Syrian regime forces surprised the unarmed civil guards in the night, killing one and wounding several others. During the funeral, at the newly opened “Shahid Graveyard,” a dusty and barren field near the city center, hundreds of people cried and chanted “Death to Assad”. Through the Syrian uprising to date, cities like Qamishlo, Derik, Efrin and Kobani have been safe heavens from the bloodshed in the rest of the country. 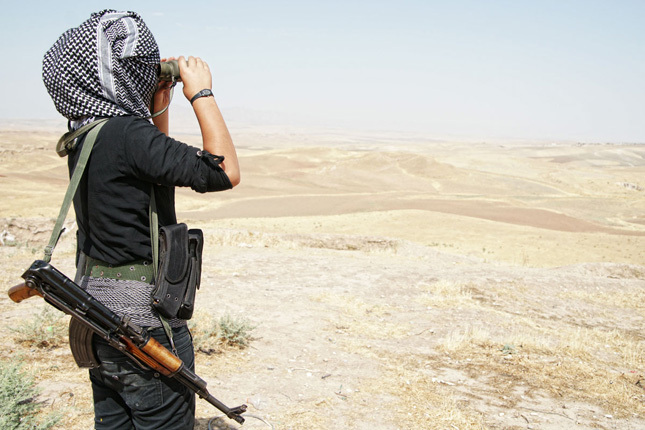 An estimated 40,000 Kurds have fled the violence into these cities and surrounding villages. Also, Arabs with relatives in the region have begun to arrive, similarly seeking shelter from the spreading violence. Several factors play into the relative stability. First, there are far fewer regular Syrian soldiers deployed in the Kurdish region, with most forces redirected to defend the regime in Damascus, Homs, Aleppo and Idlib, where the fighting has been heaviest. Evidence of Midi’s assertion is readily available. In the province of Derik, oil wells are a common sight, while villages beside them have barley any electricity and often suffer from high unemployment, the overwhelming majority of the local population able to work only seasonally. Meanwhile, Kurdish cultural traditions are actively repressed. It is forbidden to teach the Kurdish language. Kurdish dances and other cultural expressions are viewed by the regime as opposition to the state and have been punished with up to ten years in prison. Hundreds of Kurdish activists have disappeared over the years. To tighten the regime’s grip on the Kurdish region, some 300 thousand Kurdish citizens where stripped of their passports. Ironically, the unrest of the last year has offered the Kurdish movement an opportunity to rebuild its cultural heritage. Kurdish activists have established cultural centers all over the region. In the small village of Bestasos, accessed by crumbling roads from French colonial times, the opening of such a center was celebrated recently. To implement its “third position,” the Tev-Dem has started to stage peaceful rallies in all Kurdish cities. At the same time, parallel state structures are springing up, including the Kurdish self defense force YPG (Peoples Protection Union). The Kurds do not wanted to relay on rebel armed forces like the Free Syrian Army: Too deep is the mistrust between Kurds and the Arab and Islamic opposition groups. “We are, of course, not against the armed uprising of the FSA,” explains Aldar Xelil, and activist from Tev-Dem. “But we fear that its political aims, influenced by the Turkish state, will ultimately turn against us.” He points to an incident that occurred during the Syrian National Council meeting in Cairo in which the SNC shunned the idea of special rights or compensation for Syrian Kurds in an imagined Post-Assad era. The Kurdish delegation left the meeting in a fury. The soldiers where stripped of their uniforms and weapons, then allowed to return to their home cities. It this was not possible, due to the civil war, they were placed house arrest in the old army buildings. In Kobani, the outer city perimeter was quickly fortified with checkpoints on all major roads (flying the Kurdish flag) and heavily armed fighters controlling each incoming car. “We want to prevent any members of the Free Syrian Army, but also regime spies, from entering the city,” said one masked fighter, proudly displaying his newly acquired shotgun. Some of the weapons used by the Kurdish fighters were smuggled into the country via northern Iraq. Other weapons were acquired on the black market or confiscated from Syrian Army and police forces. In the city center of Kobani, life now seems to go on quite normally. Children run through the streets, small shops are open, and after 10pm, people gather to eat together to celebrate Ramadan. Still, there is a pervasive feeling of caution and suspicion, particularly towards outsiders. In Kobani alone, activists claim some 250 martyrs. Most of the dead had joined the Kurdistan Workers’ Party (PKK), which leads an armed struggle for a free Kurdistan in the Middle East, but others died in Syrian prisons due to involvement in political activities. But not everything went according to Tev-Dem's plan during the two weeks I visited the region recently. Fighting broke out in Derik, the town surrounded by important oil fields, over the Kurdish action to take over the city. Around 30 Syrian soldiers holed up in the main military headquarters. The gun battle lasted for several hours, with bursts from AK-47s echoing through the narrow streets. Neighbors watched the escalating firefight with awe, applauding each Kurdish fighter, until the first bullets hit civilian houses. The YPG started clearing the streets and setting up traffic controls to prevent seal off the area gripped by the firefight. Eventually, Kurdish fighters brought in heavy weapons, including RPGs and a heavy machinegun, and the government soldiers surrendered. Kurdish forces now control several oil fields around the city. Swedy, a city some 16 kilometers south of Derik and a major deliverer of gas, is also now under the control of Tev-Dem. Tension in the region remains high, however, with battles yet to be fought. Rmelan, a strategically important oil city 28 kilometers west of Derik, was still under the control of the regime, which recently sent reinforcements, including tanks and two helicopters. It is unlikely that Bashar al Assad will give up the oil fields in places like Rmelan, which continue to provide revenue and are vital for keeping the war going in the western parts of Syria. Tev-Dem acknowledges that taking control of all the oil fields in the Kurdish areas would mean risking a full scale war with the regime, which is against both the capabilities and, activists say, the core tenets of the movement, which include preventing any civilian killings in the Kurdish areas. Disarray in Syria has fostered a new traffic in support and solidarity between Tev-Dem and the YPG and their Kurdish counterparts both inside and outside Syria, from the Kurdish autonomous region of northern Iraq to the pro-Kurdish party BDP in Turkey and more conservative Kurdish parties inside Syria. Meanwhile, teashops in newly Kurdish-controlled cities like Derik, Kobani and Girke Lege are abuzz with the dangers that come with recent gains. Caught between the Arab revolt and the interests of Turkey, which fears nothing more than another Kurdish autonomous region abutting its own borders, and a certain reckoning from the Assad regime should it manage to survive, the future can look particularly bleak. If the FSA comes to be dominated by Islamic elements, for example, with the Muslim Brotherhood acquiring power in a post-Assad era, the Kurdish militia will likely have to fight to maintain its newly acquired freedoms. Benjamin Hiller is a photographer and journalist living in Berlin. He has covered the Kurdish conflict in Turkey, Iraq and Syria. His photo-essay Guns, Slogans and Tears previously appeared in Warscapes.